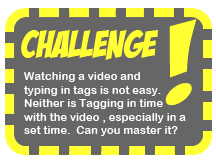 How do you want to tag? Game 1 - Golden Tag can you hunt down the tag least players have entered? Game 2 - Top Tag can you find the most popular tags. No Games, just tagging with Simply Tag.